Wednesday Oct 26, according to my Theosis devotional (from Eastern Christian Publications in Virginia) is the Commemoration of the Great and Fearful Earthquake, Constantinople, 740. Last night, 26 Oct, I felt in Rome, the new series of earthquake. From the Monks of Norcia. Take care to read down to the part about Archbishop Sample of Portland saying Holy Mass there in Norcia when the quakes hit. I am hesitant to implore you all again for prayers and support. In the midst of so much suffering, one cannot help but feel a kind of embarrassment to invite your attention to our situation so soon after the first series of earthquakes in August. Since then, we monks have been trying to determine God’s will for our lives and community. Perhaps, at least for us, this second quake is God yelling even louder His will for our lives. We pray for understanding. 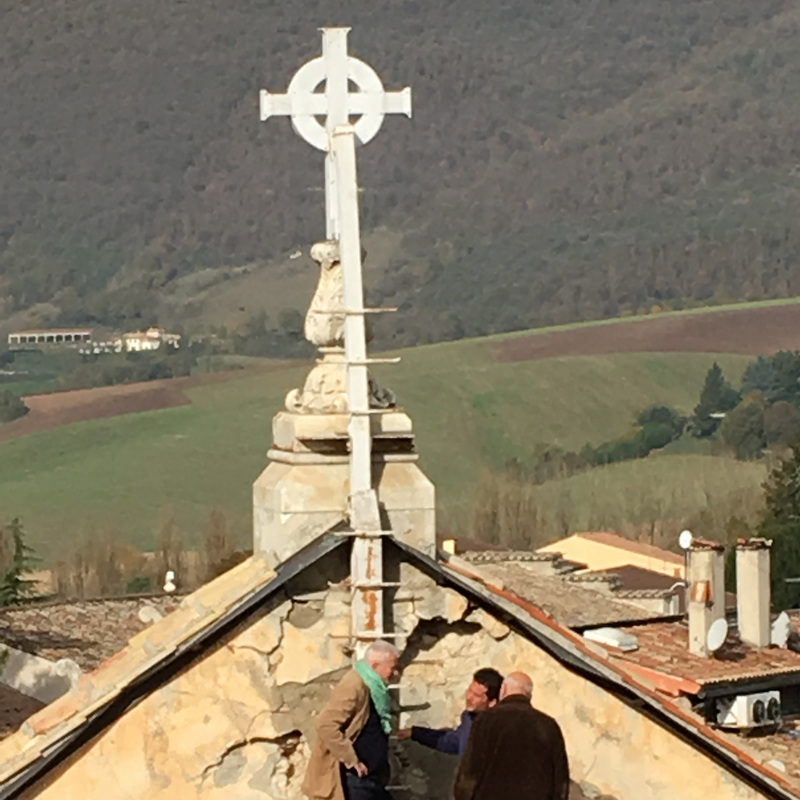 Over the past 24 hours, a powerful series of earthquakes passed through Norcia, once again graciously sparing the lives of the monks and inhabitants to Norcia. Unfortunately, however, it has brought many of the townspeople to the brink of despair and more damage than any of us can yet assess. As before, we are busy at work trying to respond to the crisis on multiple levels. Therefore, my time is short to update all of you, even though you each have found so much time to support us through your prayers and donations.? ?The Basilica fared the worst. Entire walls of decorative plaster crashed to the floor and the dome has begun to cave in. The roof collapsed in two places, leaving the ancient Basilica exposed to all the elements. Most dramatically, perhaps, the Celtic Cross which adorned the 13th century facade came crashing down. Earlier this week, engineers were examining the falling Celtic Cross, which finally collapsed after the Oct. 26 earthquakes. The 50% of the monastery which had been considered “habitable” after the August quakes has now been damaged far beyond what one might call safe livable conditions. At 10:30 PM last night, 5 of the town monks escaped to San Benedetto in Monte to join the 8 of us already here, where, after a common sip of Birra Nursia Extra, we camped out for a night of turbulence. After a few scant moments of sleep, we rose at 3:30 AM for Matins and started to accept once more that our life is not our own and God had altered our path once again, solidifying it here on the mountain top. Sadly, for the foreseeable future, this means it will no longer be possible for us to offer Mass in the crypt of the Basilica for the public. But, if God wills it, we will soon offer Mass here on the mountain. Note: If you want to help the rebuilding process, you can give to the monks by clicking here. This entry was posted in ACTION ITEM!, SESSIUNCULA and tagged earthquake, Norcia. Bookmark the permalink. I’ve just followed the link and donated to the unfortunate monks; I’m glad to be able to help them in some way. It’s just a shame that their beer is not available for purchase here in the UK (at least not as far as I’m aware), especially with Christmas approaching. Thank you, Fr. Z, for sharing this, as I would not otherwise have known. I have donated and shared the link on FB, asking others to do so. Fr. Z. 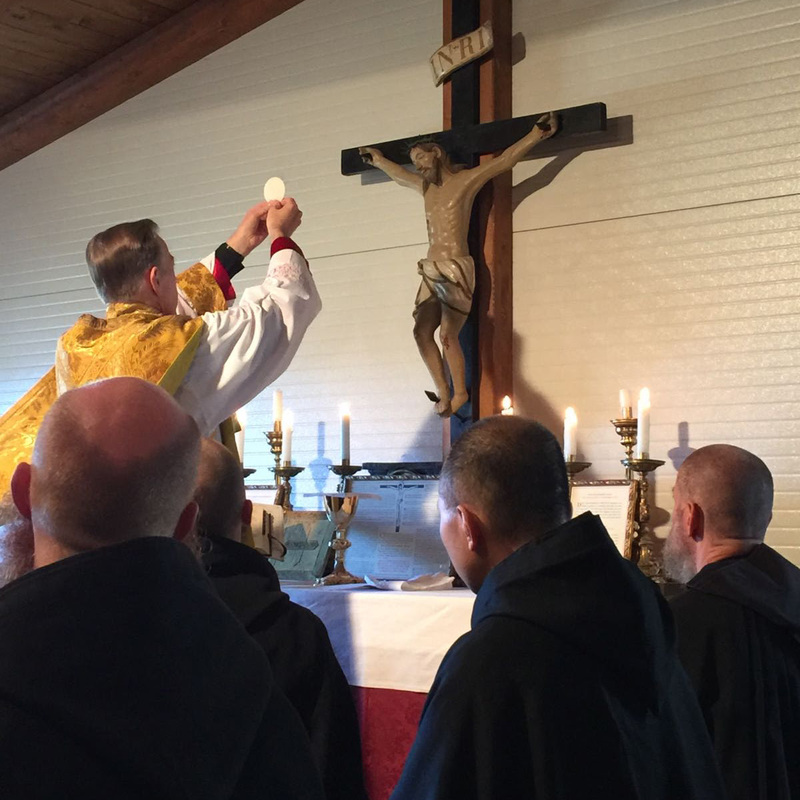 Once again I fulfilled my obligation to have Mass offered on your birthday – Happy birthday Fr Z. for the members and deceased members of FOSS and all the souls in Purgatory. and I remembered to confirm that I done that. Thank you for passing this along! I don’t know if praying for them with more knowledge is more ‘active’, but it is good in its own way. How fine that Archbishop Sample was near and could be with them!